Because I didn't cause enough blasphemy with my list of the top ten 80s movies to remake I'm back again to see which 90s movies could do with an unimaginative and soul destroying big flashy Hollywood remake! Edward Scissorhands (1990): This gothic delight from the mind of Tim Burton was the start of his beautiful (and bizarre and demented) relationship with Johnny Depp. It can easily be remade into a sharper (pun intended! ), flashier film. Perhaps go more with the quirky romance angle or make it a slasher film (god I love puns!). Home Alone (1990): This film, which has become a Christmas staple in my home, is still uproariously funny. Kevin, left behind by his family, has to stop two would be thieves. It's genius. But Hollywood has no respect, as we all know, so I can see this being remade with an adult instead of a little boy. Perhaps directed by Judd Apatow. Staring Seth Rogan. See more under the cut! Tremors (1990): A hilariously terrifying cult classic C-grade monster movie staring Kevin Bacon completely deserves a remake. Get some better special effects for the actual tremors monsters and you're all ready half way there. What I propose is we expand the premise of the film and make it a TV show! Air it on AMC before the Walking Dead. Get a strong cast of actors, keep it set in the middle of nowhere Nevada and see what happens. I predict a five season run and Emmys galore! The Silence of the Lambs (1991): This chilling serial killer film is decidedly dated. I suggest perhaps a TV show as well. Maybe modernize it. Make Hannibal younger. Keep him urbane and... what do you mean this is already a thing? Dammit, I've been scooped by Hannibal on NBC! Interview With The Vampire (1994): Look, Tom Cruise tried. He did. But he was no Lestat. Not even close. Time to bring in some new talent. I think James McAvoy would make a very good Louis, while Benedict Cumberbatch (YES, ALWAYS) would be an outstanding Armand. And our beloved Lestat? I suggest the absurdly beautiful Tom Hiddleston. I could see him in a curly blonde wig, couldn't you? With those eyes. And all the swagger and menace he had as Loki, with a pair of fangs. The interviewer? I think that should be played by David Tennant. Clueless (1995): One of the best and most quotable movies of the 90s, this is screaming for a remake. I think Jennifer Lawrence would be outstanding and insanely fun as the ditzy Cher while Nicole Beharie (Abbie Mills from Sleepy Hollow) would make a great Dion. James Franco could be her older hipster brother. I suggest Tina Fey write the script. It could be completely updated but I demand that everyone still say "as if!" at every possible moment. Matilda (1996): This lovely, quirky little film about a girl who loves to read and gains the power of telekinesis would be a perfect project for Wes Anderson. Imagine it: muted yellow colors, a respectful look at the power of literature and he's great at writing crazy as hell families. Miss Honey could be played by Zooey Deschanel. Seriously, just go all out with the hipster twee factor here. Princess Mononoke (1997): Hayao Miyazaki's outstanding film about the wonder of nature and the brutality of mankind is a seminal piece of film making. Which is why we have to ruin it. Imagine the terrible things Disney would do with this. It would be 3D and computer animated. There would be a love story. No one would care about nature. It wouldn't be violent and there would be a funny animal sidekick thrown in for good measure. Without even the Neil Gaiman script to give it life, it would be a miserable excuse of a film and sell billions of dollars worth of toys. Not all remakes can be positive. The Truman Show (1998): This film was definitely ahead of it's time. It involves a man whose life has been filmed since he was born and he has no idea. In this era of reality TV, social media and Youtube, the Truman Show is less a fanciful sci-fi movie and more of a look at things to come. I think it needs a remake for this new constantly plugged in era. It would make an amazing horror movie. 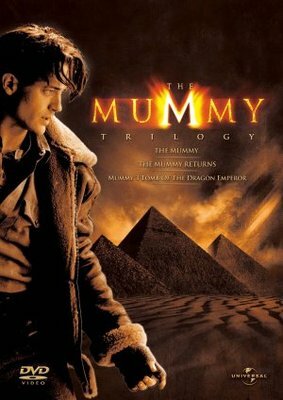 The Mummy (1999): One of my personal favorite films from the 90s. I don't know why I love this hokey film so much. It's got everything. Egypt! Humor! Romance! Horror! Brendan Fraiser could reprise his role. I suggest Nathan Fillion also join the cast. What, you don't want to see a fun romp through archeology with those two? Are you insane? Who needs a love interest, time to make this a buddy comedy, Indiana Jones style! Yes. Please remake Interview with a Vampire! The movie was gawd-awful! No! You leave Interview alone! Tom and Brad are FLAWLESS. Antonio was about 20 years too old, but otherwise, I love this terrible, horrible, wonderful movie.